This article is about the British racing driver. For other people of the same name, see John Herbert (disambiguation). John Paul "Johnny" Herbert (born 25 June 1964) is a retired British racing driver and television announcer. He raced in Formula One from 1989 to 2000, for 7 different teams, winning three races and placed 4th in the 1995 championship. He also raced sports cars winning the Le Mans 24 Hours in 1991 driving a Mazda 787B. He enjoyed much success in lower-level motor racing. Winning the Formula Ford Festival at Brands Hatch in 1985, Herbert caught Eddie Jordan's attention, and together they won the 1987 British Formula 3 title. Herbert suffered career-threatening injuries in 1988, as a then championship hopeful in International Formula 3000 when he was caught up in a major accident at Brands Hatch,when Gregor Foitek hit him from behind, causing Herbert to slam into the wall cockpit-first, sustaining severe ankle and foot injuries after multiple collisions with the barriers. The threat of amputation loomed but it eventually passed after multiple surgeries and months of physiotherapy, though the extent of Herbert's injuries would permanently hinder his mobility, leaving him unable to run and forcing him to change his driving style. Despite his immobility, Herbert returned to racing at the beginning of 1989 in Formula 1, scoring points on his debut at the Brazilian Grand Prix in Rio de Janeiro driving for the Benetton team, then managed by his long-time mentor and friend Peter Collins. Herbert finished 4th in Brazil, only 10.5 seconds behind the race winning Ferrari of Nigel Mansell and only 1.1 seconds behind the 3rd placed March-Judd of Maurício Gugelmin and only 2.6 seconds behind the 2nd placed McLaren-Honda of then double World Champion Alain Prost. Herbert's teammate, the highly rated Italian Alessandro Nannini, finished in 6th place, 7.7 seconds behind Herbert. However, Herbert's performances could not keep up to that standard (he reportedly found it hard to press the brake pedal which adversely affected his lap times), and with the Benetton team under new management he was dropped after failing to qualify for the Canadian Grand Prix (after having finished 5th in the previous round in Phoenix) and was replaced by McLaren's test driver Emanuele Pirro. Herbert returned to Formula 3000, this time in the highly regarded Japanese series. It wasn't long before he received another call from Formula One racing, this time with Tyrrell. From 1990 to 2000, Herbert was a fixture in Formula One, switching to the dwindling Lotus team, now managed by Peter Collins. Herbert moved to Benetton for 1995 and took his first Formula One victory at the 1995 British Grand Prix. After 3 years of frustration, Herbert left Lotus in mid-1994, joining Ligier and then Benetton for the last few races of the season. Although he failed to score any points in 1994, he was retained as Michael Schumacher's teammate for 1995. At the British Grand Prix, he inherited a Grand Prix win after Damon Hill and Michael Schumacher collided. He followed this in similar circumstances at Monza, finishing 4th in the championship. After being dropped by Benetton, Herbert drove for Swiss team Sauber in 1996–1998, scoring two podium places. Moving to Stewart Grand Prix in 1999, he was routinely outqualified by his younger teammate Rubens Barrichello but scored his third and final Grand Prix win in the rain-affected European Grand Prix. Staying at Stewart after the team was purchased by Ford and became Jaguar, Herbert endured another frustrating and pointless season, ending the year being stretchered off at Malaysia after a suspension failure caused him to crash heavily. Herbert driving for Audi in the 2004 Petit Le Mans. He came second, partnered with Pierre Kaffer. Herbert in his first BTCC race. Since retiring from Formula One racing, Herbert has concentrated on Sports Cars, trying to repeat his Le Mans 24 Hours overall win of 1991. Recent years have seen him as one of the front runners in the American Le Mans Series (ALMS), where he won several events and was a challenger for the 2003 crown. In 2009, Herbert made his debut in the British Touring Car Championship for Team Dynamics at the wheel of a Honda Civic at round eight of the championship, Silverstone. He qualified 17th for the first race, and after moving up the order, finished in 13th. In the second race, he finished inside the points in eighth place, scoring three points. In the final race of the day, a reverse starting grid is operated. The first six, seven, eight, nine or ten cars to finish race two, start race three in reverse order. This is decided by the winner of race two drawing a number between six and ten out of a hat. For the final race of the day, the top 9 finishers were reversed, meaning Herbert started from second. He was running well, and was holding 4th, but was forced to retire on lap 13, after contact with Jason Plato. Herbert went on to compete in the final two rounds of the season. Herbert also runs a charity event called the Johnny Herbert Karting Challenge every year for charities like the halow project which is now held at Capital Karts in London. This event invites celebrities and professional racing drivers to compete in indoor go karting and is now in its 20th year. Herbert is a regular contributor to the Sky Sports F1 channel. He is an occasional presence as one of the insiders in "Sky Race Control" during practices, qualifying sessions, and races alongside Anthony Davidson, Damon Hill, Nico Rosberg, and Paul Di Resta. In 2013 and 2014, Herbert mentored 6 contestants in a primetime ITV4 reality series, with the aim of taking players of the Gran Turismo videogames to the Dubai 24 Hour race as real drivers. Other countries in Europe had heats mentored by drivers Vitantonio Liuzzi and Sébastien Buemi. Herbert's helmet design was red with white line going from the rear going through the sides and on the mouthplate, black stripes on the lower sides a black stripe on the rear (in a similar fashion to Depailler's helmet), in 1999, when he drove for Stewart, the stripes on the lower sides were changed to green and on the top of the helmet was added a drop with the union jack. in 2000, when he drove for Jaguar, the green areas became blue. ^ Sniffer (2 September 2013). "Race That Shook The World: Brands F3000 – 1988". Retrieved 20 May 2017. 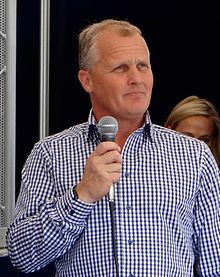 Wikimedia Commons has media related to Johnny Herbert. Herbert, Johnny (2016). What Doesn't Kill You: My Life in Motor Racing. Transworld Publishers. ISBN 0-593-07838-1.